NEW YORK (Kyodo) When students enter Keiko Takenaka’s 10th-grade classroom, they say “ohayo” (good morning), but taking their seats, they chat among themselves in a mixture of English and Spanish until class begins. 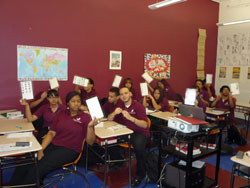 At New Heights Academy, a charter school in upper Manhattan, the students are part of a unique program where Japanese is the only foreign language offered. Despite having many language options, school administrators said they chose Japanese to expose students to a language and culture that would broaden their worldview. And with a student body that is 82 percent Hispanic, many of the students will be trilingual before they graduate from high school. Founded in 2005, the school offers college preparatory education for junior high and high school students. In addition to core classes in math, science, English and social studies, all 10th and 11th graders are required to take the Japanese program, now in its second year. Some may question the practicality of offering only Japanese as a foreign language over the standard Romance languages. But because most of the students are Spanish-speaking, Winitt wanted an unfamiliar language to level the academic challenge for all students. 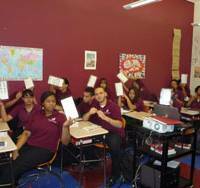 The school also serves the Washington Heights and Inwood neighborhood, a predominately Latino and black community. Students don’t have much contact with Asian societies, which Winitt says was also a factor in choosing Japanese. “Not only did I want my students to learn a new language, but I wanted the opportunity to expose them to a new culture as well,” Winitt said. Currently, the school offers sixth, seventh, ninth, 10th and 11th grades. Next year, when its adds fifth and 12th grades, enrollment is expected to increase from 468 to 750. The Japanese program will offer a third year so students can become eligible to fulfill language requirements for college admission. Takenaka, a native of Kumamoto Prefecture, teaches the introductory class to 10th-graders. During a recent class session, students translated a sentence written in “romaji” (Roman alphabet) into hiragana, followed by a short lecture about sukiyaki. Michael Brito, 16, is on his first year taking Japanese. Like many of his peers who speak Spanish at home, he said the writing has been a challenge. Speaking Japanese, however, has come easier. “The words that I remember the most are the words that are sort of like Spanish,” he said. In addition to the language lessons, the cultural component has piqued the students’ interest in Japanese culture and entertainment. “Ms. Takenaka introduced us to one of her favorite songs in Japanese. And now I listen to her all the time, Utada Hikaru,” Nicky Gutierrez, 15, said of the pop singer. Quite a few students have already expressed a desire to continue learning the language following high school. Jeffrey Rodriguez, 17, said he has been studying on his own with plans of going overseas, an idea he didn’t consider before taking the class. Although the program is still in its early stages, Winitt hopes to have annual trips to Japan in the future, something students like Rodriguez wish happen sooner rather than later.